According to the distinguished botanist Lloyd Praeger the flora of this part of the Emerald Isle “is from almost every point of view, the most interesting region in Ireland for the botanist and is the area where the special features of the Irish climate and vegetation attain their most pronounced expression”. He describes Killarney in particular as “a paradise for the botanist”. Scully, whose work is regarded as the ´bible´ of Irish flora, estimated that about a quarter of all the rare Irish plants are to be found in Kerry. There are several factors which have made Kerry a joy for the botanist. For example, our climate here is affected greatly by the Gulf Stream, giving us mild moist winters and a year round growing season. This factor is a major contributor to the sub-tropical gardens at Glanleam on Valentia Island and the record number of mosses, lichens and liverworts found in the Killarney oakwoods. The variation of habitats also allows for a greater number of plants species. Kerry has an extensive coastline, large areas of blanket bog, we have Ireland´s highest mountain range and large areas of marsh land. Historical influences have also to be taken into consideration, especially in regard to Killarney National Park. Here we have 27,000 acres of land that has been largely undisturbed for several hundred years. Among its most important habitats are a magnificent yew wood (one of three remaining in Europe), the last of Ireland´s oakwoods and large areas of wet woodland. The final factor worth considering is the variety of soil types within the county. Apart from the coastal areas, the main soil types are lime and acid. The special ingredients of habitat make Kerry a unique place for many plants – some of which are found no place else in Ireland, others which are found no place else in Europe. The moist mild climate in Kerry not only ensures that everywhere is green but also enable plants from much warmer climates to feel at home here. Many of these rarities come under the category of Mediteranean-Lusitanian. They flower from May to early July. If you head off the beaten track and take to the Kerry hills you soon find yourself surrounded by the delightful plants of the saxifrage family. The Irish Saxifrage (saxifraga rosacea) which is found in the McGillycuddy Reeks mountains and on walls and rocks in lowland areas is a mass of low lying tiny delicate white flowers which stand out again the mass of red stems. Another saxifrage very common in these areas is St. Patrick´s Cabbage (saxifraga spathularis). Its tiny pink flowers grow on a stem about 9 inches tall. The Greater Butterwort (pinguicula grandiflora) has been described by many botanists as ‘the most beautiful flower member of the Irish flora’ and is special to Kerry´s bogs and moorland. The stems grow to about six inches and produce deep purple flowers. 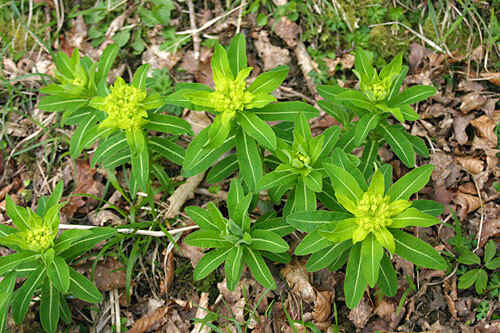 A special feature of this plant is that it compensates for the lack of nitrogen in the moorland soil by trapping insects and digesting insects in its sticky leaves. Another plant with a fly diet is the sundew (drosera rotundifolia), a small low lying plant with a rosette of green leaves covered with sticky red hairs. It’s a bit of a mystery how a plant is found in Kerry and then not found again until we travel south to Brittany and then on to southern Europe. If you take any of the nature trails around the limestone peninsulas in Muckross, Killarney then look out for this windswept trees with bark like chocolate flake. In the autumn it is unmistakable with its rough red berries or strawberries as they are sometimes known. Although they are edible it is recommended that you only eat one. This short section of the Kerry´s Mediterranean would not be complete without mentioning a plant which we were delighted to adopt. The Kerry Lily (simethis planifolia) only shows its tiny white flowers from the middle of June to the end of July. The only area it is found in Ireland is on the Ring of Kerry. Because it is confined to such a small area it is possible to assume it was not always here. The most logical explanation for its presence is that it arrived with the casks of wine and brandy which were smuggled into these remote harbours in the 18th and 19th centuries. The story is made credible by the fact that our lily is also found in the south of France, Spain and Italy. American visitors are always welcome in Ireland and this includes American flora. One plant of particular interest is blue-eyed grass (sisyrinchium angustifolium) which flowers during July and August. It is difficult enough to see its blue eye which is the most beautiful tiny blue flower. It only opens its ´eyes´ when the sun shines. The not so clever people who first introduced this large shrub in 1880, possibly as ground cover for game, have given Killarney National Park a problem which it is likely to have for a long long time to come. So what is wrong with this plant which fills the Killarney Lake District with fuchsiamagnificent pink flowers for three weeks every June? Well, not a lot, if you don’t count choking up the magnificent oak woodlands, grows so thickly and so high that it is a danger to disorientated hill walkers, smothers all ground flora and lastly is poisonous to cattle. It is also found in the Himalayas. 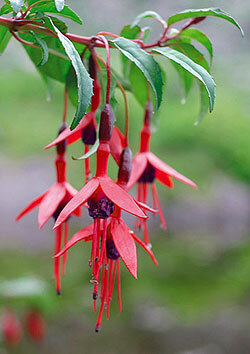 A plant which has thrived here, especially in south and west Kerry, is the Fuchsia (fuchsia magellacina). 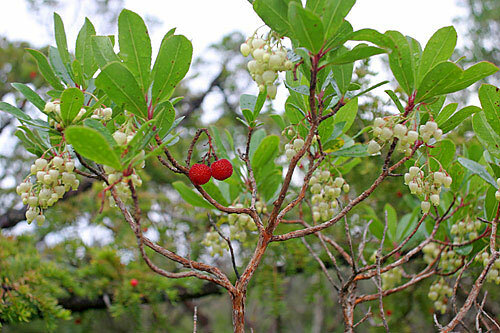 This beautiful plant is not destructive like the Rhododendron. It confines itself to ditches mostly and have a beautiful red flower from May to September. It was first introduced here over a hundred years ago from South America. In the Dingle area where it is most common it is known in Gaelic as ´Deora De´ ( the tears of God).